Recharge while you’re awake with these seven simple tips from Mary Ann Bauman, M.D., author of Fight Fatigue: 6 Simple Steps to Maximize Your Energy. This almost hour-by-waking-hour guide helps you power through your killer schedule and may even help you sleep better when you finally get the chance. Skip the French toast sticks and hash browns—a quick rush of simple sugars that can leave you tired hours later—and reach for six ounces of Greek yogurt. 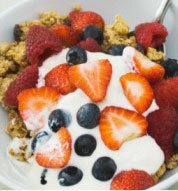 Mix in a cup of fruit and a few tablespoons of granola for a light meal that’s rich in protein and healthy fats. Mentally changing focus at least once a day fights brain fatigue. Now’s the time to take a break and call or email a friend. (Don’t feel guilty about it.) Try to keep the conversation upbeat. When you’re slammed, it’s tempt­ing to sub an instant-energy candy bar for a real meal. Not so fast. “The carbs in sugary foods will give you only a short burst of energy,” Bauman says. Instead, try a dose of energizing complex carbs, perhaps some turkey and light Swiss cheese on whole-wheat bread, plus a few apple slices. About now, it’s easy to fixate on unfinished tasks. But beware of these “energy thieves,” Bauman’s term for thoughts that annoy or disappoint us. Make a quick list of today’s accomplishments—even “I got to work on time!” counts. The energy-wise will get their 20 minutes (or more) of jogging, strength-training, or yoga now. Exercise can actually help you sleep well, which, Bauman says, is the key to starting the next day with power to spare.